Expectations heading into 2014 by many investors were mostly high for stocks and low for bonds. Many believed the Federal Reserve reversing course on their record level of monetary easing would launch interest rates higher in a hurry and force investors to flee fixed income investments. While this theory may still prove to be accurate, the exact opposite has occurred so far this year. 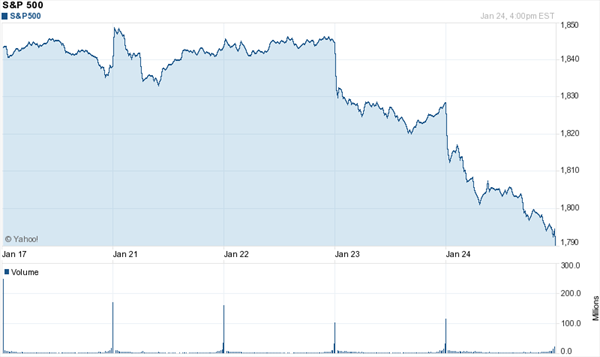 The S&P 500 declined 3.6 percent in January after finishing last week 0.4 percent lower. Meanwhile, the 10-year Treasury yield has plummeted to 2.65 percent after breaching the 3.0 percent level not long ago. One month is just that, one month. But make no mistake, it was a bad month for bullish investors. And, with this particular month being January, there will undoubtedly be numerous articles published reminding us what typically happens for stocks throughout an entire calendar year based on January performance. Before we begin this section, let us make it abundantly clear we don’t subscribe to the “January Effect,” and find it be a mythical indicator. Nevertheless, because it’s going to be plastered front and center on most financial news websites, we felt it necessary to address the statistics. Yes, it’s true that over the last 85 years stocks have finished the month of January and the entire calendar year in the same direction, positive or negative, 73 percent of the time. However, stocks have finished higher nearly 70 percent of all calendar years over that same time period. In order to really gauge the impact negative performance in January has on stocks for the entire year, let’s look at past years where January was negative. 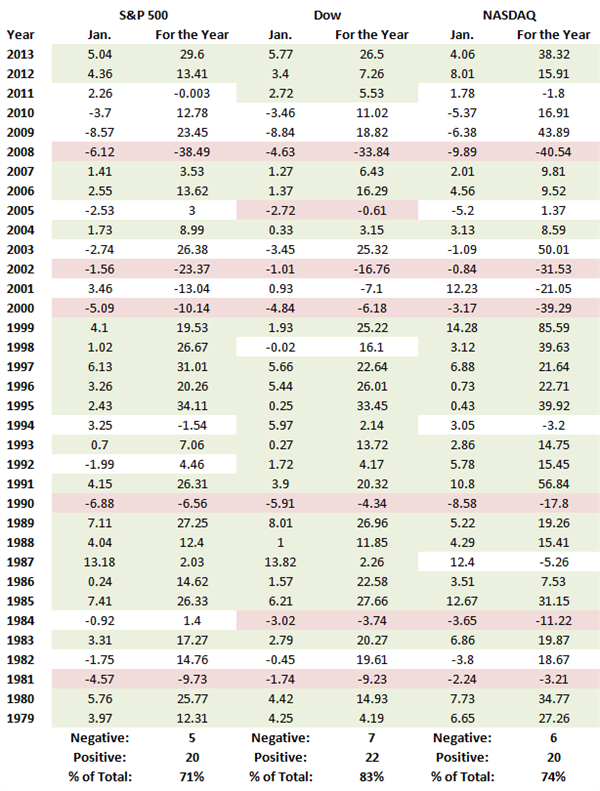 In those years, January’s returns are much less indicative of what follows. Since 1979, the month of January has recorded negative performance 12 times. 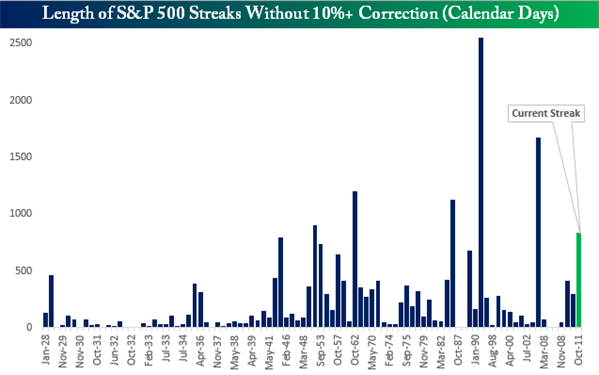 Only 5, or less than half, of those occasions resulted in stocks ending the same calendar year with negative performance. We can’t say whether or not stocks will finish higher or lower this year. Stock performance will continue to be dependent upon many economic, political, corporate, and geopolitical factors. However, simply basing the rest of 2014 on January performance is irrational and impractical. Last week featured a lot of positive data from the United States. 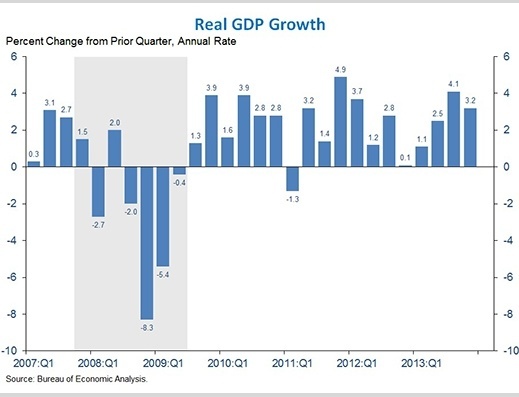 The initial reading from the fourth quarter 2013 showed the U.S. economy advanced 3.2 percent, GDP consumer confidence registered at the highest levels since last August, measurement of consumer confidence and the Federal Reserve confirmed the positive trajectory of the U.S. economy by further tapering their asset purchase program by an additional $10 billion per month. To top it off, quarterly corporate earnings results have so far mostly reported better than expected. However, all of these positives were overruled by further confusion overseas. Between the Federal Reserve tapering, and last week’s data showing China’s economy may be weaker than expected, certain emerging markets are witnessing record declines in their currency values. The key factors to watch going forward will likely be whether or not troubles in emerging markets continue to get worse and how that will affect the overall global economy, in addition to an onslaught of more corporate earnings releases over the next several weeks. Note: Gross Domestic Product (GDP) is the monetary value of all the finished goods and services produced within a country’s borders in a specific time period, through GDP is usually calculated on an annual basis. It includes all of private and public consumption, government outlays, investments and exports less imports that occur within a defined territory.